Make and bake brownies as directed on box, using oil, water and eggs. Cool at least 1 hour. Line cookie sheet with waxed paper. In large bowl, crumble baked brownies. Using 1 1/2-inch cookie scoop, scoop out brownie mixture; roll into balls. Place on cookie sheet. Freeze 1 hour. In 1-quart microwavable bowl, microwave candy melts uncovered on High 1 minute 30 seconds; stir. Continue microwaving and stirring in 15-second intervals until melted; stir until smooth. Remove balls from freezer. Dip tip of each lollipop stick into melted candy, then halfway into 1 cake ball; place on waxed paper-lined cookie sheet. When all brownie balls have sticks, gently swirl 1 ball into melted candy to coat well; allow candy to drip back into bowl. Place stick in polystyrene foam. Sprinkle top with candy sprinkles. Repeat with remaining cake balls and melted candy. Let candy harden before serving. 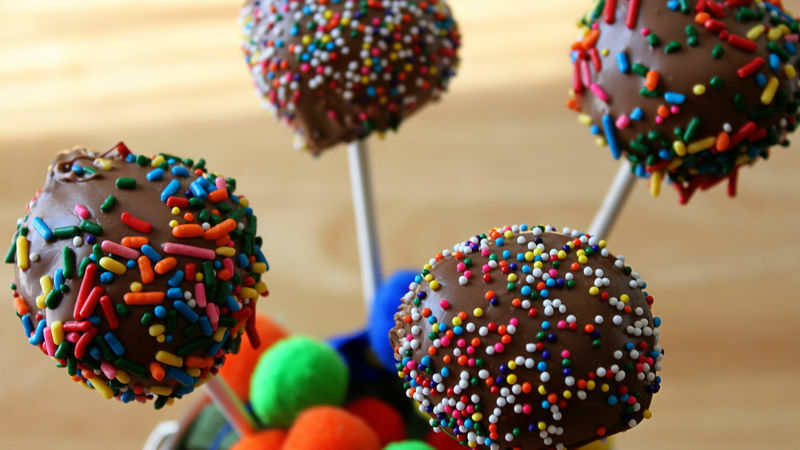 You can use any color of candy coating to make your brownie pops special for any occasion!